Andy Murray ended Britain's agonizing 77-year wait for a Wimbledon men's singles champion on Sunday when he destroyed world No.1 Novak Djokovic 6-4, 7-5, 6-4 in the blistering heat of the All England Club. The 26-year-old became the country's first male winner since Fred Perry in 1936. It was Murray's second Grand Slam title to follow his breakthrough triumph at the US Open in 2012 which followed his Olympic gold medal as well as a heartbreaking, tearful loss to Roger Federer in the Wimbledon final. Both struggled in the stifling 40 C heat and the top-seeded Serb, who had beaten Murray in the Australian Open final in January, looked jaded after his record four-hour 43-minute semifinal victory over Juan Martin del Potro. Murray, who has played in the final of his last four majors, had break points in the first and third games, with the Scot pouncing on his seventh for a 2-1 lead. The British second seed took the opener 6-4 after 59 minutes with a love service game, having hit 17 winners to six and with only six unforced errors to the world No.1's 17. 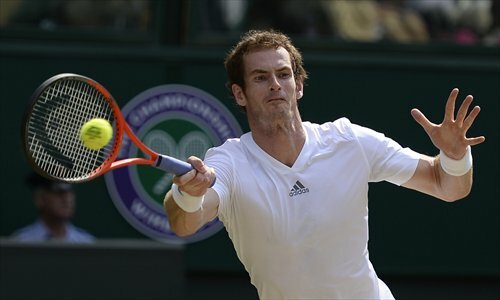 Murray wasn't getting complacent - he had won the first set of the pair's last three meetings and still lost the match. Djokovic was obviously aware of the history, speeding into a 4-1 lead with two more marathon rallies of 30 and 32 shots. But Murray roared back to 4-4 in a final which, despite its punishing hitting, still felt flat with both players too similar in style and then appearance when they both donned white caps to combat the sun's glare. In his fog of anxiety, Murray mugged him for a break to lead 6-5 and went two sets to the good at 7-5. Murray finally achieved his place in history when Djokovic netted a backhand after three hours and nine minutes of action.